Another very close to the site. The only tree that survived the attacks. Side of sourth reflecting pool. South reflecting pool. There are two pools, each representing the footprint of the towers. Online reservations to visit are free, and there were a line of people on a cold NY morning. A little further away from the site, near Vesey. On the way to the site. St. Paul's Chapel, which functioned as an emergency medical center for the first days after the attacks. I had an early morning breakfast meeting in the financial district, so I made an online reservation then picked it up and walked a few blocks to the Ground Zero memorial. The photos are in reverse order and offer a sense of how much rebuilding there still is to be done ten years later. Some weeks have more high points than others. Last week was exceptional. On Thursday I talked about Advice From A Risk Detective at the Harbor Club for the Women Business Owners monthly meeting. Lots of laughs, lots of good questions and comments. It made me see that what I intended is happening -- people will use the book to become better prepared. On Friday morning, the UPS truck pulled up with the proof for a second book. It's of enormous pride that initially dividing ASA's work into two areas -- consulting services for clients, and the Institute for Risk and Innovation, where we write and publish, has actually paid off. Reflections on Risk is mostly the work of ASA's research interns since 2009. It makes an important contribution to the broader discussion around operational risk. I am pleased that it arrived it time for me to carry it next week to the Global Associations of Risk Professionals conference in New York, to my business meetings, and then New York University to show the InterCEP team following a Global Risk Network session. We are out in the world, and loving it. Just as we were putting finishing touches on a second book, I got quoted in an article on book publishing in Business News Daily. I'm usually luckier than this in quotes -- here it sounds like the only thing I learned was to use both a designer and a typographer. I actually learned a lot more than that, from other truly great people who worked on the book in addition to its designer, Jesse Brown. I worked with a total of three readers, but the yeoman work was done by Molly Martin from firstandunion.com, who ended up doing the editing. From Molly, we learned how to be careful on basic consistent style elements across a whole manuscript, and how to move versions along carefully. For myself, most of all, I learned more about a book's architecture and volume -- and will be applying those lessons while writing what will be a third book that Tautegory Press will publish early next year. This time around for our second book -- and here's a sneak preview of the e-store page for "Reflections on Risk" -- we did a better job of proofreading from the outset. 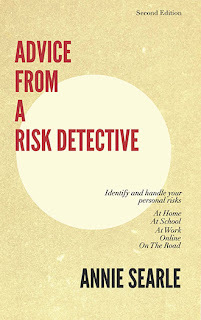 We used Jesse Brown to design the cover so that it has that same spare elegance as "Advice From A Risk Detective." And we found a new team member in Stephanie Martindale, the typographer for this book. She'll be doing all our interior work going forward into the third book on the horizon. The challenge with publishing is of course to find the time to write, promote and market your books. I've been mulling the ironies of having two books I don't have time to market, and that's a discussion I'm taking to New York this next week when I talk with colleagues who've been doing this a lot longer than me. Last evening, breaking news came in the form of a Wall Street Journal article that caught iPhone users by surprise, announcing that Google had managed to turn off certain privacy protections of the Safari browser used on iPhones. In his morning blog, Seth Godin speaks coyly when he says that if we really cared about our privacy we would not use a credit card or talk on a cell phone. He thinks it's the element of surprise that drives us crazy, not the fact that assumptions we made about the privacy of our personal information were wrong. Seth's light-hearted skip around the question strikes me as irresponsible. Our world has been forever changed by the advent of digital technology in all of its forms. It is possible to strike agreements on how our personal information will be protected and under what conditions. Data protection has become such a significant problem that there are currently two congressional bills pending. If you'd like more information on what I think, then take a look at my February column for the ASA newsletter. You can find it here. I've been refining a power point presentation for my talk next week at the Women Business Owners meeting. The timing is fortuitous, since it gives me a chance to go back through the book to find its key messages several months after it came on the market. What may not be as clear as it could be in the book is that making a plan in no way restricts spontaneity. Developing an "all hazards" plan increases your ability to be flexible yet resilient. I'll have more to say about this in a coming post. On the second Monday of each month, at a very early hour of the morning in Seattle, my firm publishes a newsletter that gathers information, news and research on risk-related topics and publishes them in an easy reading format. Included this month in the newsletter is an excellent research note from Andrew Hansen on Pacific Northwest Earthquake Risk. You can find all of the newsletters with their research notes included on the Annie Searle & Associates LLC website. Or, if you'd rather, just drop me a note with your email address and I will add you to the mailing list so you'll have the pleasure of finding the newsletter in your mailbox the second Monday morning of every month. Kudos to IBM and its chief privacy officer, Harriet Pearson, for rolling out tools to show parents, teachers and students how to handle online threats such as cyber-bullying. Harriet is also security counsel to IBM and I had a chance to hear her speak then talk with her at the Executive Women's Forum. Check out the IBM announcement. As soon as I find out how interested groups can obtain access to the training, I'll let you know. In the meantime, here's a post by Harriet on the importance of thinking before you lay down a trail on the Internet. I haven't done any public speaking on the book yet, but that will change on Thursday, February 23, when I speak at a monthly luncheon meeting for women business owners. It's a powerful group that I hope will carry the messages of the book back to their employees. If you're interested in attending, just click on this link to sign up: Seattle Women Business Owners. Here's a great ComputerWorld article on how to properly protect your Facebook profile and history, now represented as a "Timeline." Time spent now may save you significant problems down the road. As much as I have cautioned clients, colleagues, family and friends about being prudent and to exercise good judgment about what to post on Facebook, I am constantly amazed by the embarrassing things people put out there for the whole world to see. And if you think that your privacy settings will protect you from the predatory nature of the algorithms, then you deserve to be called a lemming looking for the highest cliff. When you like something, keep in mind that you have given your consent for your name, image and likeness to be used as an endorsement in any context. Your photo can be used anywhere and you might be in the company of other people that you do not want to be associated with. When all the lemmings line up, you might be giving away a part of yourself that can be used in a most unflattering context or pose. Remember, algorithms have no heart. Be careful what you show, post, like and say. Lemmings never see the cliff until it's too late. This Bloomberg article is an eye-opener on what sends insurance rates soaring! In my book, I cover a number of risks, inside and outside the home, that could lead to higher rates but clearly my own experience is limited in a couple of these areas. Take a look and see what you think. Natural disasters have presented themselves more frequently this past year. Nowhere is that truer than in the state of Alabama. Recovery efforts from earlier tornadoes stalled out when still another round hit the state. In a New York Times story today on Alabama tornado alerts, the recommendation turns out to be alerts set on your smart device, as well as from social media channels like fan pages on Facebook. I spend more time in the first chapter of the book, describing what types of alerts can be set. And it's worth mentioning that those alerts can go both ways. When a power outage affected over 2,000 homes in this area early yesterday morning, I was able to tweet to Seattle City Light a report of the outage. I'm happy to say the site was monitored, and so I got a tweet back, saying the outage was being worked. In some cases, you'll be offered several channels through which you can receive alerts. My recommendation is to sign up for more than one option since these alerts are automatically generated once the data is in the system. For sure, sign up for text messages in case all other channels are overloaded or unavailable. The other standard issue communications device for your emergency kit should be a battery operated radio that is set to the emergency notification channel. That way, if power is out altogether, you can still receive alerts via this radio.